FLORENCE, ITALY: I don’t think I need to say much about Florence…after all, Florence is Florence. It’s not only the capital of Tuscany but it’s also the capital of Renaissance art and rich culture. In fact, Florence was the birthplace of the Italian Renaissance and was the most important city in Europe for couple centuries in the Middle Ages. Florentine architects from that era also invented Renaissance and neo-Classical architecture which later gained much popularity in whole Europe. Scientists and explorers like Galileo and Amerigo Vespucci are just to name some more Florence’s talented sons. This is also the city where Opera was invented. 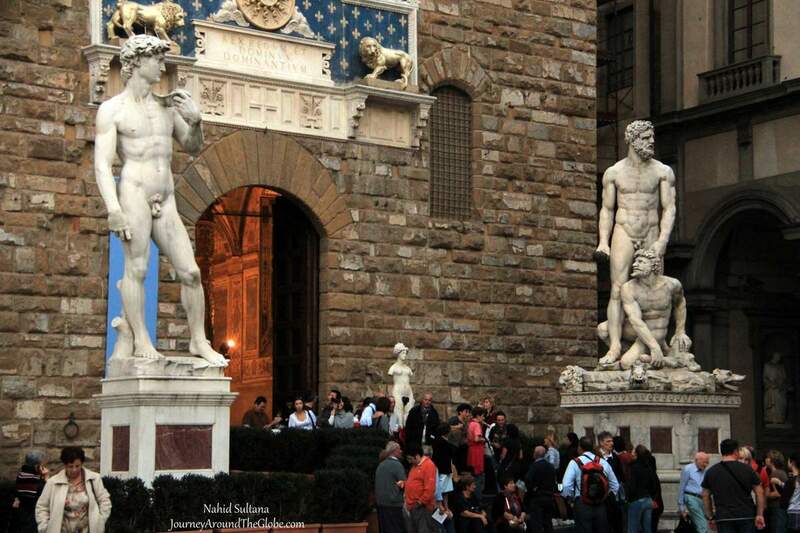 And finally, dominating artists like Leonardo and Michelangelo called Florence or Firenze their home. Located in Italy’s irresistible region Toscana (or Tuscany) and by romantic Arno River, Florence is a city with endless enchantment sites and timeless tranquility. It’s not easy to escape the spell of Florence when you are surrounded by such astonishing culture. It is one of those places that offers too much to its visitors and one of those cities that is sophisticated with very down to earth mood. 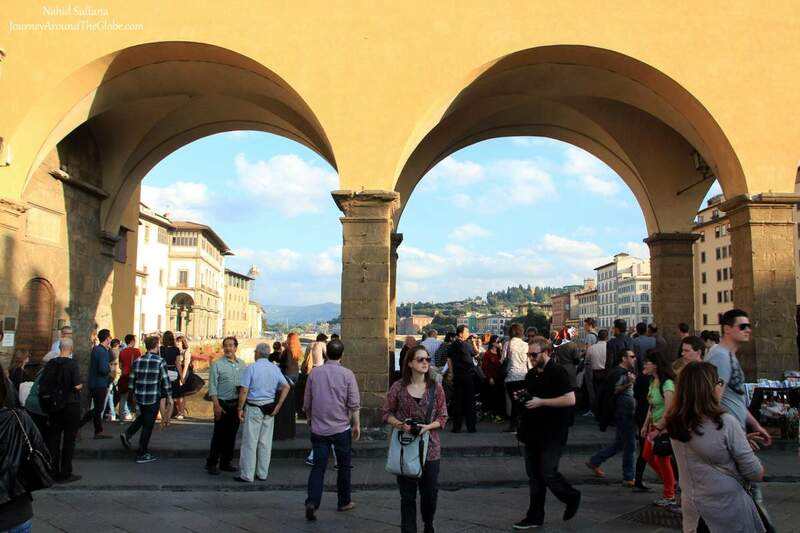 When you enter Florence, you enter the Renaissance time…that connection with time is made instantly and involuntarily. It’s hard not to wander off and be distracted with Florence’s mesmerizing history and atmosphere. Florence can be a great point to start off your Tuscan journey or it can be a perfect base to tour around this region. Making day trip to Pisa, Siena, San Gimignano, or other close by towns are very easy if you have your own car or if you take help of public transportations. Old part of Florence has several parking garage surrounding its city center and closer to the main sites. We parked our car in Garage Giglio where we kept our car for the whole day for a reasonable amount of fee. TIME of TRAVEL: It was our second time visiting Florence. First time we were in Tuscany was in February of 2012. Winter was bad in whole Europe that year, even in Tuscany, which was very rare. It was not really enjoyable walking in below freezing temperature for us. During our next visit in October of 2013, the weather was perfect and the summer tourists were almost gone. We still carried a light sweater for the evenings, but walking under the sun during day time was pleasant. OUR HOTEL: First time we were in Florence, our hotel was Hotel Castri in Piazza del Independenza. 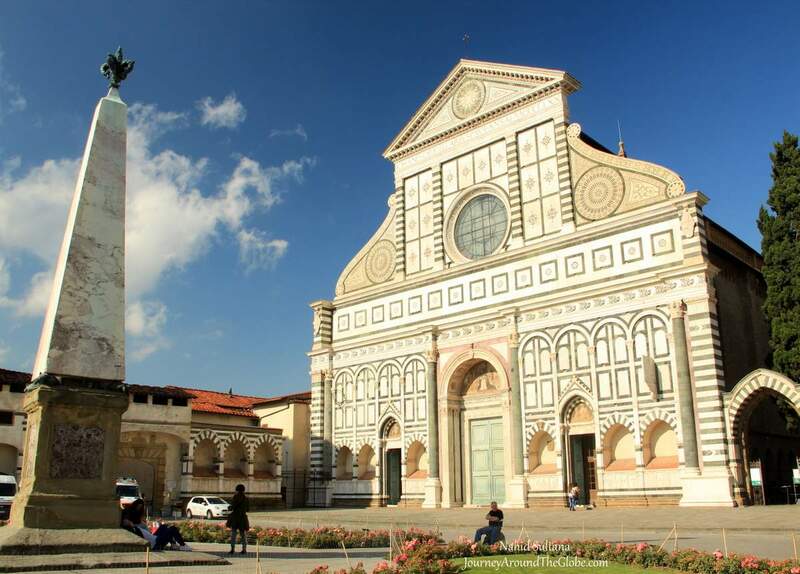 It was conveniently located within walking distance from Florence Duomo and all the other attractions. Second time, we stayed in “My One Hotel in Radda” for the whole time in Tuscany. It’s located in the hills of Chianti…a place which is not only famous for its wine, but also for its art, history, natural beauty, and simplicity. This was a 4 or 5 star resort. We had free grand breakfast buffet, spacious room, clean linens, and excellent customer service. But above all of those, the best part of it is the view from our balcony or from the hotel terrace. 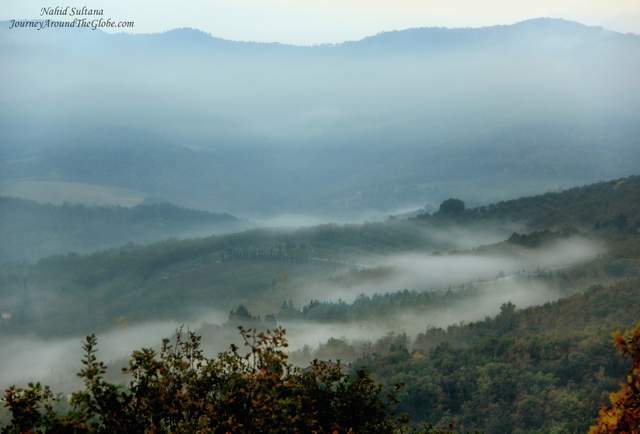 Standing on the upper terrace one early morning, I got the perfect glimpse of Tuscan hills and trees hugging the autumn clouds…it was a breathtaking feeling. I felt like I didn’t need to get out, I could have just sit in my hotel balcony all day and enjoy Tuscany right from there. Florence was about an hour drive from our hotel in Radda in Chianti. EATING and SHOPPING: When in Florence, you would want to try almost everything from street food to fine Italian gourmet cuisines. If you are yearning for something extraordinary, treat yourself in a dinner theater with good food and good time. Visitors don’t have hard time finding a place that will serve delicious food with local colors, aromas, and flavorings. Don’t forget to enjoy some gelato afterwards or stop at local bakeries for divine Italian desserts. 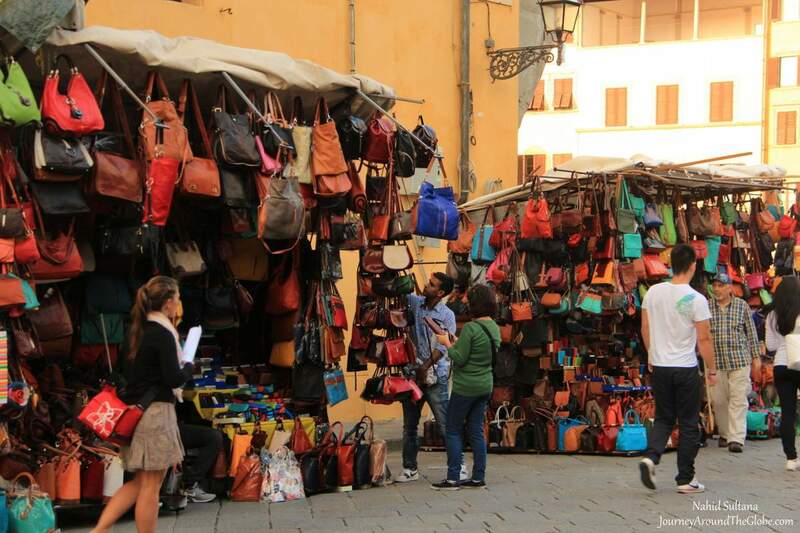 You will never regret buying anything like honey, trendy jewelries, and leather boots from Florence. All the pasta packets, olive oil bottles, leather goods, brand name shops, ceramics, potteries, scarves, shawls, and jewelries got me over excited for some little shopping in Florence. PLACES WE’VE VISITED: It was the second time we were in Florence. First time we visited few medieval churches and piazzas mostly. Second time we visited more churches, and other sites. But Florence is a city where you can spend weeks visiting museums and still be longing for more. Its churches are stuffed with some of the finest arts in the world and the art galleries are packed with brilliant paintings and most famous pictures. While Uffizi Museum is probably the best one to visit, many basilicas, medieval churches, artistic fountains, art galleries from different eras, outdoor markets, more than 80 museums, numerous historic buildings and palaces, public parks, and finally relaxing piazzas can keep any visitor busy for a long…long time. 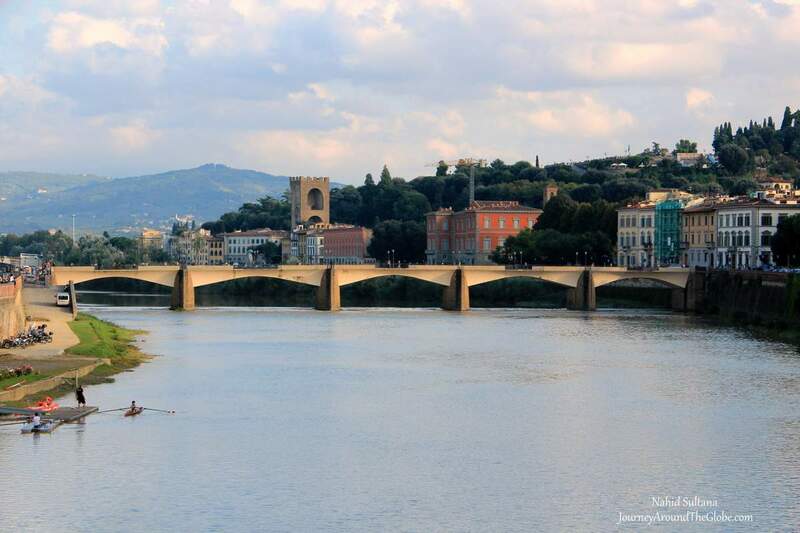 Walking along River Arno or crossing any of its bridges can be nice if you have some extra time. If you are in a tight schedule, best thing is to pick up a map from your hotel or a local store, see which sites interest you the most, and plan your trip accordingly. We explored Florence mostly on foot without using any public transportations. It was a bit exhausting but we got to see more of the city that way. It’s always better to park your car outside the historic center and take on from there. 1) BASILICA SANTA MARIA NOVELLO: After parking our car, we crossed a big road to come to this bold edifice. This bigger version of an original church begun in 1279. Its internal structure resembles that of Cistercian Gothic churches. The major 14th-century decorative schemes date from the years after the Plague of 1348. Among many beautiful frescoes in this basilica “Last Judgement Hell”, “Paradise”, “Trinity with the Madonna, “Scenes from the life of Noah” are to name some and most of these frescoes are from the 14th and 15th Also, look for the fresco “The Passion and Resurrection of Christ” from 1367. Some of this basilica’s key attractions are its high ceiling, many over-sized medieval paintings and artworks, tombs of some famous Florentine sculptors and bishops. Don’t forget to spend some time in its cloister, few courtyards with old paintings, tombs, and museums which are beside the main church. Chapterhouse from 1355 is also accessible to the tourists. The square in front of the basilica, Piazza Santa Maria Novello, is a tourist-packed center with hundreds of pigeons. The church is open until 5 pm everyday. Guided tours are available Saturday, Sunday, and Monday at 2pm and 3:30pm. Ticket is 5 euros for anyone above 8 years. 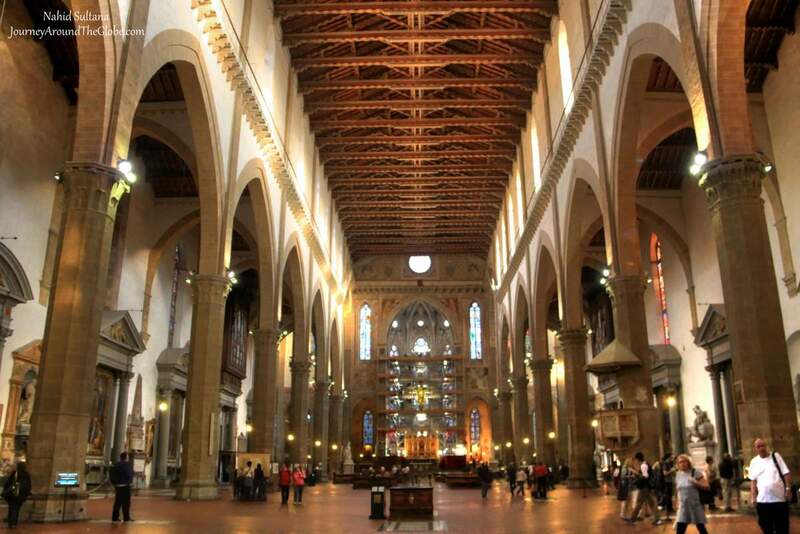 2) BASILICA di SAN LORENZO: Basilica di San Lorenzo is known to be the first cathedral of Florence from 393 A.D. and another haven for Renaissance neo-Classical splendor including few Michelangelo sculptures. San Lorenzo was consecrated in the year of 393 by St. Ambrose of Milan. Rebuilt in the 11th century, it was completely restructured in 1418 and finished in 1461. Michelangelo’s New Sacristy can be reached through the Chapel of the Princes. Don’t forget to pay a visit to the 15th– century cloister. This is a big basilica with beautiful golden and white ceiling, nice artworks, gorgeous dome, and frescoes from the 15th century. Donatello’s last work of art, the bronze pulpit from 1465, is a must-see treasure here. The basilica is open from Monday to Saturday from 10 – 5pm. Entrance was 4.50 euros per adult and free for anyone 8 years or below. The ticket includes church, cloister, and museum. Library beside the basilica needs separate ticket. Audio tour costs extra but worth it. Photography isn’t allowed inside San Lorenzo. Once you are out of the church, indulge yourself in the leather stores for jacket, purses, boots, and etc. 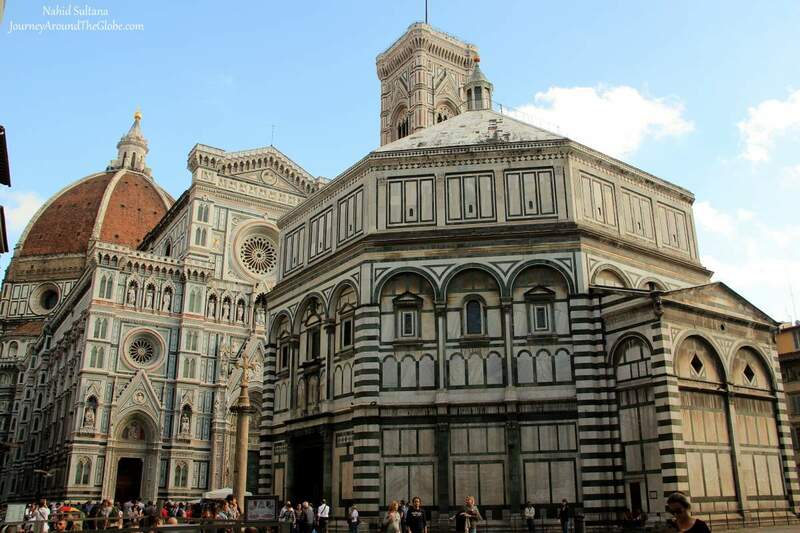 3) CATHEDRAL di SANTA MARIA del FIORE or FLORENCE DUOMO: Duomo di Firenze in Piazza del Duomo is the iconic landmark of Florence and number one attractions for any visitor. The Renaissance dome of it is the third largest in the world and dominates Florence’s skyline. The construction started back in the 1200s. An excavation from 1965 shed some light to the ancient basilica of Santa Reparata which today can be visited more than two and a half meters below the floor of Santa Maria del Fiore. If you ask me, Florence Duomo has a grand interior like many other cathedrals in Europe, but may be not as fabulous as its outer appearance. Its signature stripes all over the outer wall instantly catch everyone’s attention. 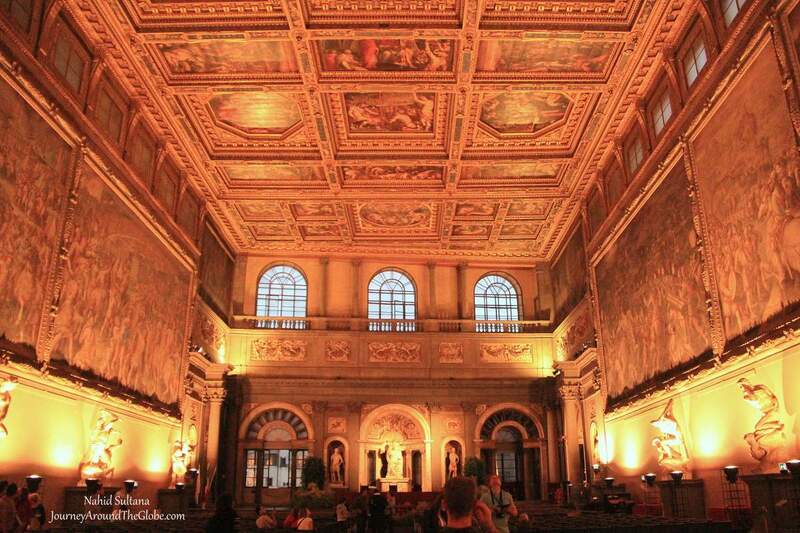 Inside the basilica, the frescoes on the main dome and its marble floor are elegant and fiery. Be sure to visit its crypt which is an important archeological site in Florence. Although we didn’t do it, climbing the Dome of this cathedral or Giotto’s Bell Tower offers some spectacular views of the city with a small fee. Just keep in mind that you have to climb 414 steps to get there and there is no lift. In front of the dome, in Piazza San Giovanni, is the medieval Baptistery which is famous for its bronze doors from the 14th century. Decorations for both of these buildings are examples of transition from the Middle Ages to the Renaissance. It is free to enter the cathedral itself, have to pay extra to visit the dome, tower, Baptistery, or the museum. Audio tour is highly recommended and costs only few euros. 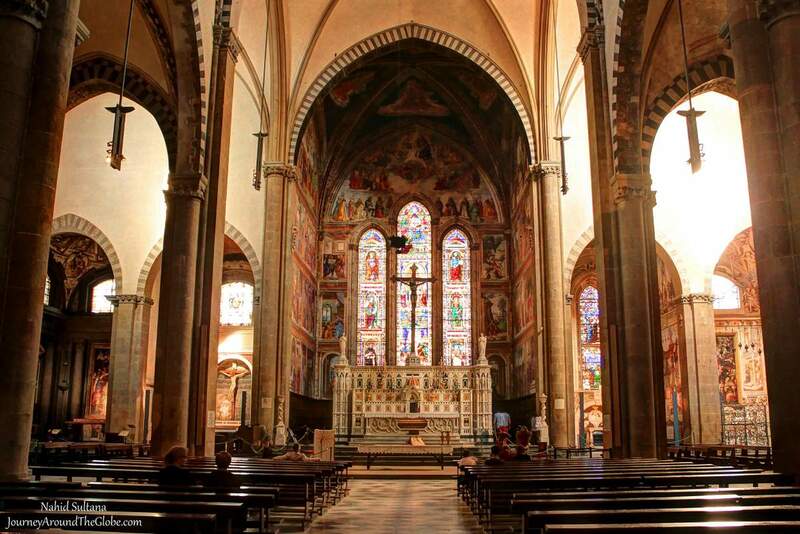 4) CHURCH of ORSANMICHELE: Another of Florence’s old church is Orsanmichele. The origins of this building go back to the 8th century but was demolished in 1239. The present look is from 1337 and the image of Madonna and Child which gained much attention those days is from 1346. It is a small church with gorgeous interior and exterior. No photos are allowed inside the church, but it is free to enter and look around. 5) PONTE VECCHIO: Surrounded by the ultimate grandeur Ponte Vecchio is the oldest and most famous bridge over River Arno. 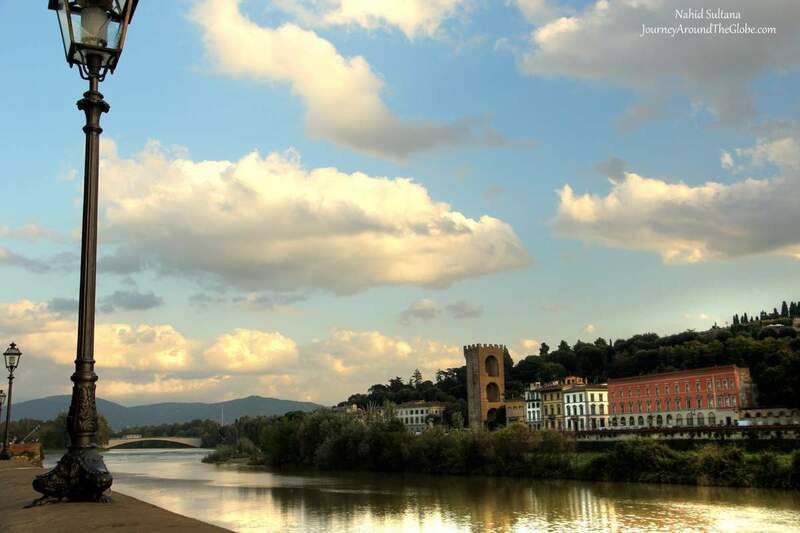 It’s a pedestrian bridge with beautiful views of River Arno on the both sides, if you can manage to see the river over the countless jewelry stores and tourists. This bridge was probably the successor of an ancient Roman bridge that, some believe, was a bit further upstream. The first mention of the bridge dates from 996 A.D. It was ruined by floods several times, especially the collapses from 1117 and 1333. Finally in 1345, it was rebuilt so sturdily that it has survived to the present intact. The bridge belonged to the Woolmakers’ Guild, butchers, and green grocers until the end of the 16th century when the Grand Duke Ferdinando I ordered that they be taken over by gold and silversmiths which it continues even today. The uniqueness of this bridge come from the small, projecting shop windows featuring jewelry with their old-fashioned shutters and doors. 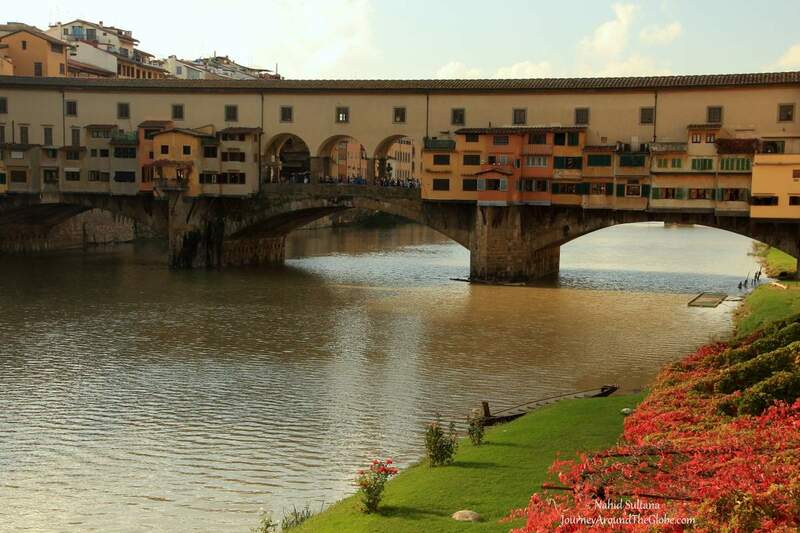 This was the only Florentine bridge that survived WWII bombing raids, but the two areas at either end were destroyed. 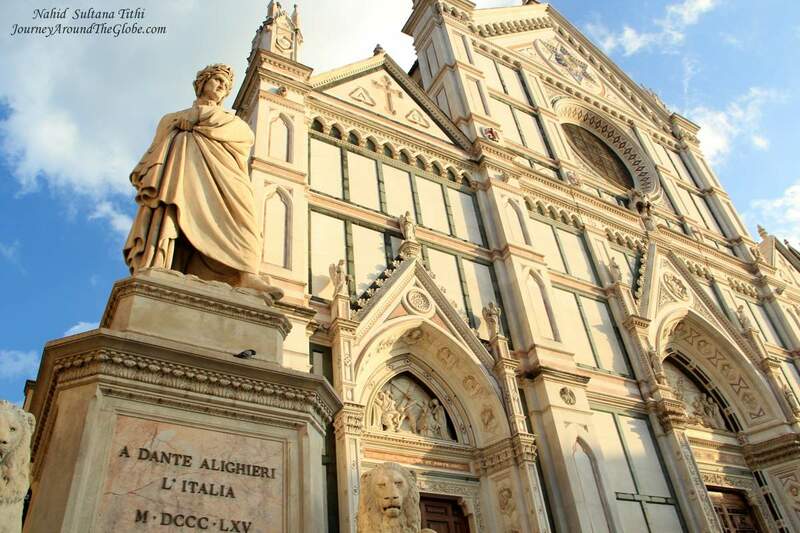 6) SANTA CROCE: Santa Croce is one of the finest Gothic churches in whole Italy and a must-see in Florence. It shelters numerous masterpieces, like 14th century Florentine paintings, 15th century sculptures, and funeral monuments of great Italians. The present basilica was built in 1295 on the site where the first Franciscan friars to arrive in Florence had a small oratory. Upon entering this Florentine Gothic style basilica, the attention immediately is drawn towards the stained glass windows piercing the walls. One of the fundamental features of early Franciscan style that this basilica carries is the frescoed narration including stories of Christ, St. Francis, and other saints. The carved Renaissance pulpit from 1475, with Scenes from the Life of St. Francis, is one of the most beautiful in Florence. Of the great 14th century Florentine frescoes survived ‘til today and can be seen in Santa Croce. Some of the 14th century paintings can also be seen inside this basilica. 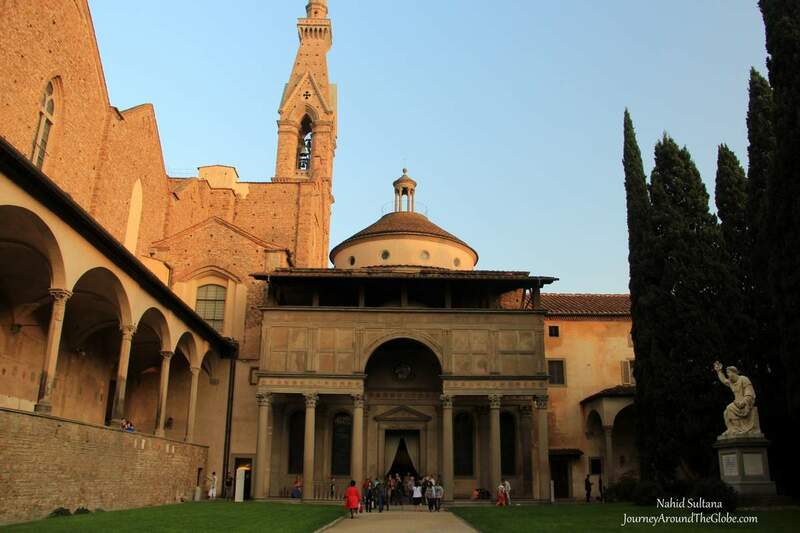 Pazzi Chapel from 1429 is a great example of harmonious building of the Florentine Renaissance. Other Renaissance architecture and works include Annunciation and Crucifix – both by Donatello and Madonna of the Milk by Antonio Rossellino. The Statue of Liberty that illuminates New York with her torch, has a precursor in the Basilica of Santa Croce in Florence. But this Florentine statue represents The Liberty of Poetry, and thus the freedom of art and of creative genius in general. It is significant that Santa Croce, which was to become the resting place of so many great Italians, has the first truly Renaissance funerary monument in Italy. Sepulchers and memorial tombs include many notable Italians like Leonardo Bruni, Chancellor of the Republic Rossellino, Galileo Galilee, Dante Alighieri, Michelangelo, and so many others. During our visit the altar of Santa Croce was under renovation. 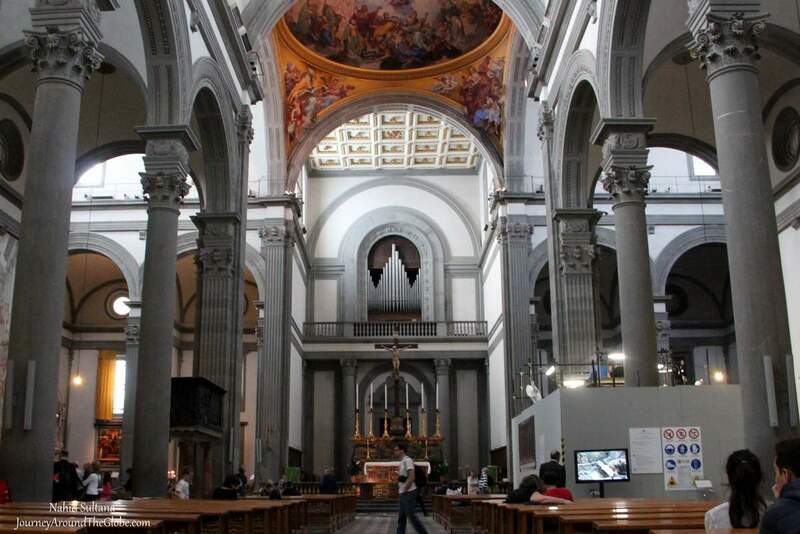 The church museum and many of Santa Croce’s chapels house countless centuries-old artifacts. The attached cloister is magnificent to tour also and the plaza right in front of Santa Croce is a bustling section of Florence. The basilica is open from 9:30am to 5:30pm from Monday to Saturday. 6 euros entrance fee gives you access to all the areas of the complex. 7) PALAZZAO VECCHIO: This used to be the City Hall of Florence at one point. With its gorgeously adorned exterior, a replica of Michelangelo’s David stands outside by the main façade. Also known as Palazzo della Signoria, Palazzo Vecchio is a sleepy beauty with aristocratic homes and many fashionable apartments in Piazza della Signoria. This place exhibits some of the greatest pieces of art of all time and many important collection of Renaissance paintings, sculptures, and arts. You will see sculptures by Verrocchio – a Florentine artist and sculptor who was much appreciated by the powerful Medici family. The ceilings, hallways, and old furniture in each section are something to admire. You will find many old maps in the archive too. The Palazzo is open until midnight and charges 10 euros per adult. It didn’t take us more than an hour for the whole palazzo. One thing to keep in mind is that every information here is in Italian, so may be getting an audio-tour would be helpful. 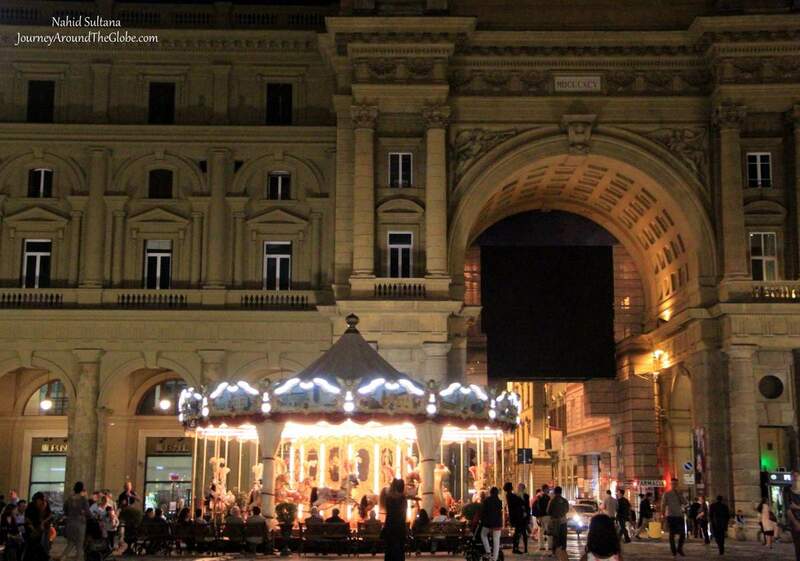 The piazza itself is a big place to hang around while enjoying few statues, fountains, and old buildings. Day or night, this place can be a nice spot to relax or stroll. 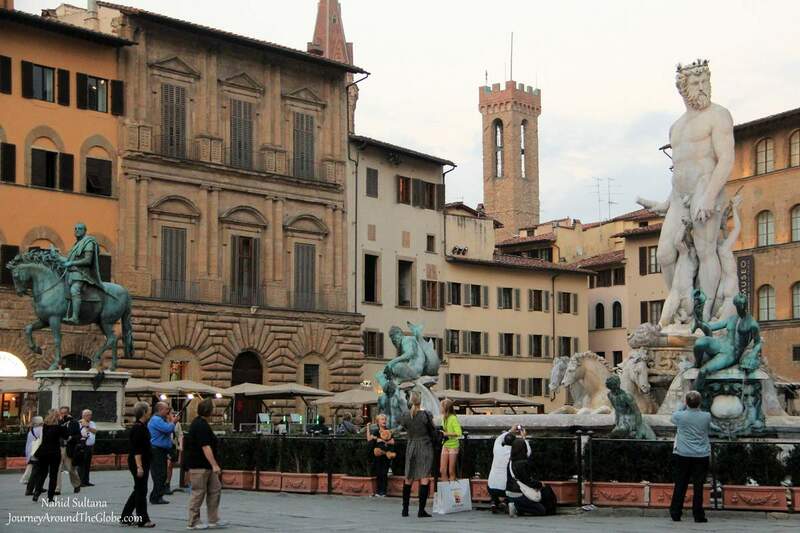 8) PIAZZA della REPUBLICA: This was one of many piazzas of Florence and a beautiful one too. We were there around evening, after visiting all the above places. While my girls hopped on to the merry-go-round, I went around the square to enjoy some live music. There is a big arch/gate at one side of the square. I found many cafes, restaurants, and shops where I only wish I could spend hours…only if I had that much of time.